Caprese Grilled Cheese Sandwich. We had to do it. You know we’ve got basil growing faster than a speeding bullet. Add a ball of fresh mozzarella able to leap tall buildings in a single bound. And an Italian bread getting eaten faster than a locomotive…I must act quickly. 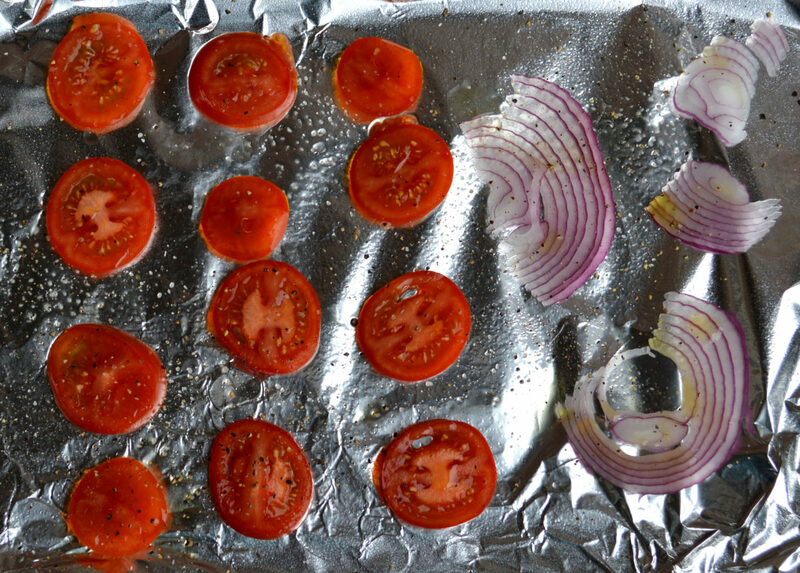 Add oven roasted vine-ripe tomatoes, thinly sliced red onion, and a drizzle of balsamic vinegar. Oooh my my. Oh yes yes. Honey put on that paaarty dress. Preheat oven to 400 degrees. Line shallow baking sheet with foil coated with cooking spray. Spread tomato and onion slices in a single layer. Drizzle with olive oil and sprinkle with salt & pepper and roast for 10 minutes. Meanwhile butter one side of each bread slice and set aside. Press roasted tomatoes with paper towels to absorb access moisture. Then layer onto bread slices. Top with mozzarella cheese slices, fresh basil, red onion, and a drizzle of balsamic vinegar. Pan grill until golden brown on each side. I cannot wait to try this recipe. My mouth is watering looing at the picture. Thanks for offering up this fresh recipe as I am looking for more “meat free” ones for my grandkids. They love fresh vegetables and cheese and I look forward to fixing this one for us.